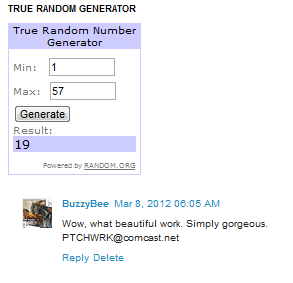 Congratulations, BuzzyBee! I’ve sent you an email. Please respond directly to that email in order to claim your prize. I want to thank everyone who entered. The Carnet de Voyage Travel Albums are beautiful, and I hope all of you are able to enjoy one some day. Thank you Karen, and Exaclair, for the chance to try out these fantastic travel albums for myself, and to share my joy with others through this giveaway.